This Malaysian Standard is intended for use by all businesses that produce, distribute or utilise geospatial data, either alone or in conjunction with non-geospatial data. These range from geographic information systems, decision support systems, data mining, data warehousing, to modelling and simulations. Application areas include but not limited to resource planning and management, automated mapping, geo-engineering, construction, communication, transportation and utilities. It provides a system for feature and attribute coding by which producers and users of geographic information may use in structuring their digital spatial data. This standard facilitates sharing and exchanging between both data producers and users. This Standard represents a major improvement over MS 1074:1992 and contains some 2000 additional features and organised into twelve main categories such as aeronautical, geology, soil, utility and special use. 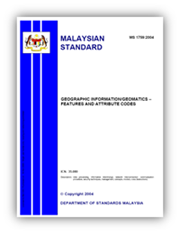 This Malaysian Standard specifies the method for encoding of geospatial data and provides the description of features and their associated attributes for the exchange of digital geographic information. The following normative references are indispensable for the application of this standard. For dated references, only the edition cited applies. For undated references, the latest edition of the normative reference (including any amendments) applies. 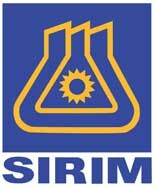 For the purposes of this Malaysian Standard, the terms and definitions given in ISO/DIS 19104 apply. This Standard describes the encoding of the world in terms of features and attributes. Features are real world objects while attributes are properties or characteristics associated with the objects.